Now let me first give you some story about ayu fish. Ayu, which is translated “sweetfish” because of its unique flavor said to resemble watermelon, is a summer delicacy. No Japanese can pass summer without savoring it at least two or three times at home or restaurants. The ayu fish lives both in salt and fresh water. 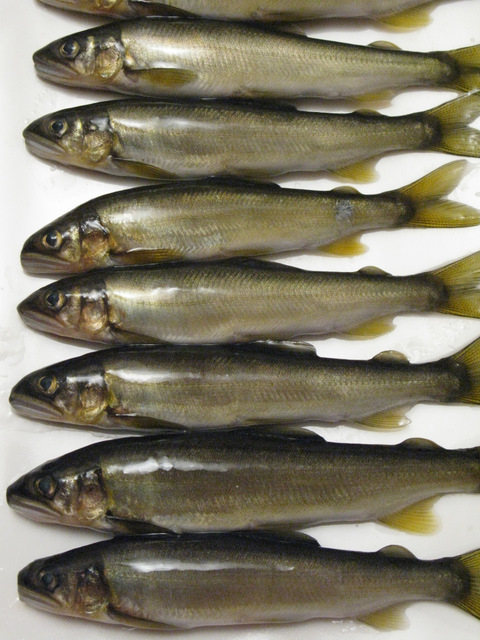 The adults fish (about 8 inches long) swims down the river, gather and spawn in the lower part of river in late summer through autumn. 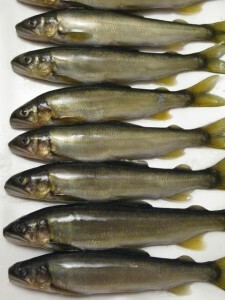 The fry remains in brackish water (coastal water) during the winter until spring. Starting March the fry (2nd photo), which has reached to about 2 inch lengths, begins to swim up the stream to mate and have fun in the river. While they are staying in the river, one of their principal diets is moss on the rocks. The fish then returns to the river for laying eggs and then finish their one year life cycle. In order to keep the population of ayu at good numbers, Japanese government regulates and sets a date for lifting a ban of catching ayu fish. It is called ayu no kaikin-bi, and starts at the beginning of June (each local has different date across Japan). Fishermen, both commercial and avocational, rush to the river and catch the fish. Every year once the ban of catching ayu is lifeted restaurants both in the city and country, where the fish is caught just nearby their river, beings to feature a special abyu meals. It starts with soup with ayu, salt grilled, fried, braised and richly flavored and ayu cooked with rice. Every Japanese wait for this once a year delicacy. Among several ayu dishes, salt grilling is the best preparation in which we can enjoy fish’s natural flavor. 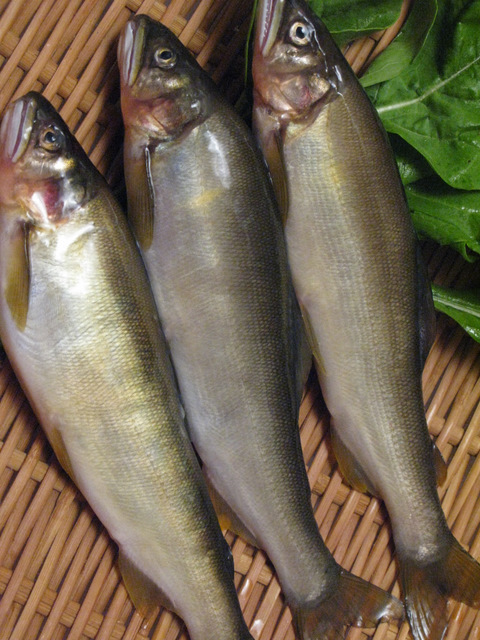 Unlike other small-size, whole grilled fish preparation, ayu is cooked whole with its intestine. 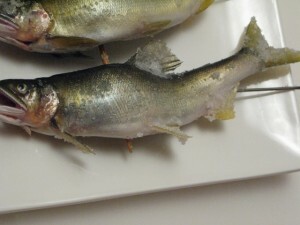 The bitterness of its liver is not a negative taste sensation, but it is an important element to enjoy this refined, sweet-tasting fish. Before grilling, fish is put on a skewer in a way so that fish looks like swimming in the stream when it is served on a plate. This technique is called uneri-gushi (3rd photo) and you can see it in the photo below. Skewered fish is then sprinkled with sea salt. 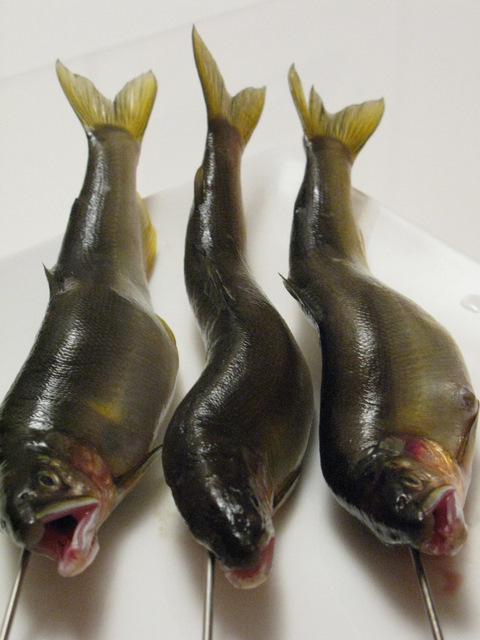 As you can see in the fourth photo the tail and fins of the fish is heavily salted. Salting these fragile parts with additional sea salt prevents them from burning during the cooking over open flame. The best heat sauce for grilling ayu is bincho-tan (refer the previous bincho-tan blog). Grilled ayu is traditionally served with tade-zu (tade herb mixed with vinegar and sake). Tade plant grows near the water at the time where ayu is caught. It is known having very bitter to taste (a sharp burning sensation on your taste buds but does not hit your nostril), but its compliments to the bitterness of fish liver. Also, this plant, like other bitter herbs, aids digestion and stimulate appetite. Tade has also antiseptic property. I will post the delicious ayu rice – ayu cooked with rice in a traditional rice cooking pot – in the following post.